Rock, jazz and psychedelic concert. 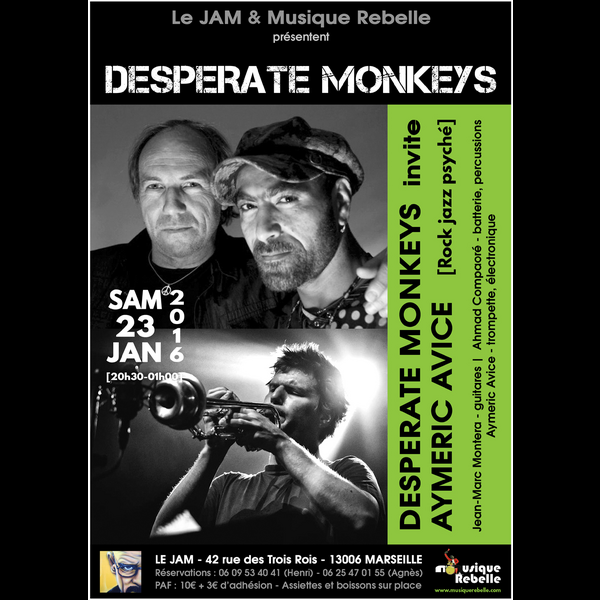 Desperate Monkeys (Jean-Marc Montera, guitars / Ahmad Compaoré, drums) invite Aymeric Avice, trumpet. The first two met in the early 90s on the project "Helter Skelter", a rock opera by François-Michel Pesenti set to music by Fred Frith, and they became inseparable. Among the various musical experiences they conduct together, the encounter with other musicians plays an important part. The one proposed tonight with trumpeter Aymeric Avice (from the trio Jean-Louis, Radiation 10, Magma...) is no exception to the rule of a full opening at the crossroads between free musical forms. A music where rock, jazz and psychedelic influences should mix with those of non-European musics while keeping its own identity.